Wigs are ubiquitous! Wigs are a great way to get creative while doing minimal damage to your hair. Whether you’re looking to change up your look for a night out or you want to add a wig to your daily beauty routine, wig options are virtually endless. To help you fully wrap your mind around what seems to be an infinite amount of styles, constructions and variations, we’ve gladly taken the time to bring you a basic guide of everything you need to know before getting started with this exciting and useful accessory! Why most of black women wear wigs? What are they actually made out of? How to choose a right wig? What types of wigs are available? Why choose real human hair wigs? How to ake Care of a Wig? Wigs are worn by more people today than ever and it’s no coincidence. First, wearing wigs can be a great protective style. You can save your hair from the daily rigors of normal styling as well from heat styling. Another reason is that the overall quality of wigs has improved so much. With the improved quality of materials along with better wig construction, synthetic wigs can like real human hair wigs. Lastly, it can be just plain convenient! Hmmm, protect my own hair and not have to do it all the time? That's win-win! There are two kinds of wigs: Human hair and synthetic hair. The natural hair is mainly sourced from India or Asia and costs significantly more than the faux version. But if you're looking for something more affordable, opt for a synthetic wig that's heat resistant. There are tons of wigs available for Black Women in the market.There are many pros and cons for choosing each one of the wigs like human hair or synthetic wig. To start with Synthetic wigs are less expensive than the human hair wigs. But there is more to choosing a wig than only the price factor. Both real Human hair wigs and Synthetic wigs have the pros and cons. It must be quite clear now that human hair tend to last longer and are more versatile on the other hand Synthetic hair wigs rarely lost their style and are more economical. There are many different types of wigs on the market. It can be hard to decide which type is best for you. This is a quick guide to help you understand the differences between different types of wigs. 1.Lace Front Wigs: This type of wig has a lace front along the front hairline and the cap material differs depending on how long this wig is worn. 2. Full Lace Wigs: A wig that's made with full lace throughout the entire wig cap. The lace is either made of French or Swiss lace. 3.Whole lace Wigs offer parting anywhere. The construction of these wigs is very lightweight, stretchable. They are usually handmade which means the strands of hair are manually tied to the lace. The mesh lace allows for the hair to be parted any where, is breathable and light weight. These wigs still have combs and adjustable straps with hooks for secure fit. 4.Synthetic Hair wigs:Synthetic hair is generally less expensive than real human hair. It can be made up of many different hairs and generally doesn’t last very long. You cannot use hot styling tools when wearing a synthetic wig unless you get a heat safe version. 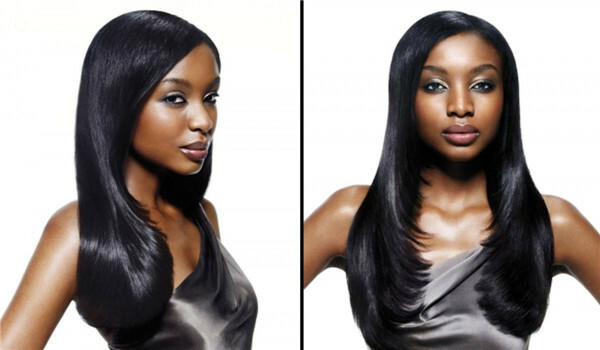 Either way, you need to treat synthetic hair differently than you would treat real human hair. Make sure your hair is clean and flat. Either pin down or braid into cornrows. Always wear a wig cap! This helps the wig stay on your head and protects your hair from the wig’s inner lining and friction. Always secure your wig to your hair using combs that are inside of the wig cap to ensure a snug fit that won’t slip. Some wigs are adjustable, so getting sized at a specialty store is recommended for a perfect fit. The Sophiaschoicee above is wearing UNice hair: Brazilain body wave hair 20'22'24'26'+14' frontal. It is really nice and silky and flat irons great. Human Hair wigs provide ample styling options because you can do anything to a human hair wig that you can do with real hair that grows naturally from your scalp. They are also much more expensive than synthetic wigs. Curling or straightening these wigs is not an issue at all! Before you commit to a hair accessory, consider the expense. While synthetic wigs can set you back anywhere from $5 to a couple hundred bucks, a natural wig can cost anywhere from $100 to $3,000. 1.learn the difference in maintenance between a human hair wig and synthetic wig. Pay attention to the care instructions attached to your wig or ask your retailer how to maintain it. 2.Invest in shampoo and conditioner especially for your wig. Using regular shampoo on your wig can ruin the hair's texture or leave it in a tangled mess. Your washing technique should be different. Invest in a wig brush to brush the tangles out of the hair. 3.Don't use hair spray or shine spray on your wig. If you keep spraying your wig with different products it would be greasy and unmanageable. It's recommended that you avoid spraying your wig with any type of shine spray. 4.Don't use heat to style or dry your wig. Just like your own hair, using too much heat can damage it.If you aren't sure how to style your wig, take it to a stylist and have them make the changes you want. 5.Don't sleep or shower with your wig. Remove your wig when you are in the shower, pool or heavy rain. You should avoid sleeping in your wig to avoid knots and tangles when you toss and turn. 6.Do keep your wig covered and upright or covered when not in use. When you aren't using your wig, it's important to store it carefully to protect your hair from tangling and dust. We know that you want to express your own unique style, so at UNice, we offer the largest selection of wigs for sale online. Looking and feeling your best has never been so easy because UNice has the best wig deals with prices and savings few can resist. Your everyday look can be as casual or fabulous as you wish, with UNice’s vast wig collection specially made with black women in mind. So whether you’re looking for curly wigs, a silky straight, long black wig for a Cleopatra look, a sassy short wig in the hottest ombre color, or classy bob wigs with bangs, we have it right here. Define your own style, mood and attitude with one of our latest lace part wigs, Remy human hair wigs or U-part wigs. Shop more UNice online wig shop for wigs for black women and keep the heads turning.